225 30th Street, Sacramento, CA. Pain, anxiety symptoms, or symptoms of depression that you would like to be rid of ? Would you like a nice relaxing massage that will put you to sleep and take away your symptoms of anxiety? Are you feeling tight, with painful joints? Is it hard for you to concentrate and have clarity or focus? Is your body pain bringing stress with your relationships, job, and life problems? Are you ready to step away from all of the above & learn how to manage it yourself? Release the Pain uses modalities of Myofascial Release, Craniosacral Therapy, and Orthopedic Structural Massage, Active Release Therapy, and Muscle Energy Technique, similar to Reiki or Bowen Therapy, to help your body repair itself to healthy function and give relaxation to the body, mind , and spirit. I pride myself in giving you quality, effective work where you will feel the difference on the 1st visit. *If you live out of the area- please find a Myofacial Release therapist trained by John F. Barnes, or an Orthopedic Structural Massage Therapist trained by James Waslaski -for help with structural improvements and pain relief and a therapist trained by the Upledger Institute in Craniosacral Therapy for body,mind, and stress relief. Keep up with Release the Pain on the Facebook page. Learn how to manage your body and your life so you can have bliss, peace, and true happiness. Be sure to "Like" our Facebook page. Do not for one moment think that you have to live with the pain or dysfunction. Allow me to help your body correct itself naturally, the way it was created to. Do you have a lot of stress, areas of pain, or an emotional/mental fog that you wish would leave? Have you already been treated by your doctor, Physical Therapist, chiropractor, or massage therapist for chronic pain but it's still there and they said you have to live with the pain? Do not give up hope -that may NOT be true. I have been able to help others find relief from pain in these situations. I use bodywork manipulation & stretches and I offer consultation to help you gain emotional freedom by using easy, conscious thinking exercises. I believe stress, if not released, can build up and show up in the body as pain or disease. This causes pain, which is the body's way of informing you that something needs to be corrected. The body's notification that something isn't right, the pain, should not be ignored...because if you ignore it, the pain will simply persist and probably increase, until something is done to allow the body to heal itself and correct the situation. I believe all conditions are reversible, and that the body can heal itself...if you create the right circumstances for that to occur- such as with a corrected diet, proper body movements , and with structural assistance- such as myofascial release therapy. I believe in most cases medications and surgery only create an environment that makes it more difficult for the body to heal itself. Myofascial Release relieves stress, similar to or even better than Swedish massage, without having to undress, (you wear loose fitting shorts and tshirt), and I do not use any oils or lotions. My technique utilizing Myofascial release therapy, CranioSacral Therapy, Orthopedic Structural Massage all help the body to release and move the fascia. This releases the emotional stresses, allows circulation (such as it does in accupuncture and accupressure), so that oxygen and nutrients are exchanged within the body's cells and atoms- bringing health and function to the body. Myofascial Release, the John Barnes method, is a simple and inexpensive, (compared to the costs of conventional medicine and drugs), treatment that releases the fascia leading to pain reduction, and most of the time, pain elimination. Emotional and mental stresses are also released giving the client a feeling of wholeness and profound relaxation. Using mild, gentle, hands-on sustained fascia manipulation, it is done without oils or lotion. Allowing the fascia connective tissue to release its bindings, restrictions, and adhesions helps us to develop a healthier state of body and mind. It is a natural method used to bring safe, lasting and beneficial help to the body and mind of adults, hyper active children, and colicky babies, and the elderly with signs of dementia. Clients use it to help curtail surgery and drugs, in many cases. In some cases one visit is all that is needed, but it is most effectively done as a treatment program with 3 visits total, or a frequency of one to three times per week for several weeks in severe cases. This allows the tissues to release, the body to move back into proper alignment, and for the home exercises and yoga to be practiced and understood for continued improvement and maintenance of the fascia. Individuals suffering with pain issues from auto accidents, sports and work related injuries, headaches and migraines, trauma, cancerous tumors and radiation treatment, back pain, and more have found pain relief, based on client documented testimonies of Myofascial Release therapists. Fascia is similar to a web of fabric and connects continuously from the top of our head to the end of our toes. Fascia is enmeshed inside and around, holding up and connecting, to bones, ligaments, blood vessels, organs, and cellular fluid. The fascias job is to help us function at our optimal level. When there has been long term poor posture, trauma, injury, inflammation, or emotional stress the fascia restructures itself and toughens up, creating scarring and adhesions- thinking that it is protecting the injured areas and guarding from further trauma. During the times of chronic poor posture, injury, inflammation, trauma, repetitive use as in sports or work, and emotional stress - unless we have taken the time to release these restrictions that showed up for “protection”, the scarred and bound up fascia will increasingly pull on the surrounding connected fascia fabric creating pressure, pain, dysfunction, and further binding in areas away from at the trauma site. Because of these bindings, restrictions occur at the organs and tissues that are enmeshed with the fascia, preventing them to receive the proper nutrients needed and thus causing further breakdown in the body systems. Over time, the local toughening and hardening restrictions will make our bodies weaker, thus setting us up for further injury. Click Below for support and information to Improve your vision naturally. It has testimonies and is guaranteed to work. 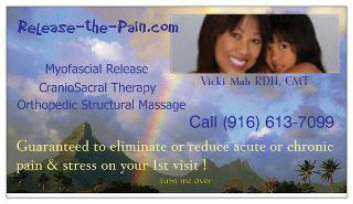 How can Vicki help you with Integrated Muscle & Orthopedic Massage Therapy? By eliminating pain and dysfunction, restoring structural balance, and enhancing performance. Hard, painful IT bands and loss of range of motion quickly and easily resolved. Vicki combines all methods of Craniosacral Therapy, Myofasical Release, Orthopedic Structural Massage and Muscle Energy Technique. Pain is an actual or potential tissue damage that may have been caused by trauma from a sports injury, or injured while in an auto accident, from repetitive use, repeating the same motion over and over again at work or sports, or practicing a passion, such as playing a musical instrument, using the same parts of your body. Pain may also be from long term poor posture on the job, or conditions such as scoliosis, headaches, and fibromyalgia, or by having had surgery where the scar tissue continues to build up and clump together over time putting pressure on the nerves, organs, and tissues causing the pain. This can even occur from having tattoos. All of the above and more unfortunately results in lower back pain, upper back pain, shoulder pain, neck pain neck and shoulder pain combined, groin pain, sciatica pain, sports pain, knee pain, foot pain, or frequent urination. Utilizing Myofascial Release and Craniosacral Therapy allows Vicki to help her clients with these and many other conditions. See "Testimonies". She provides caring service to her clients in Sacramento and surrounding areas, including Rocklin, Granite Bay, and El Dorado Hills. If you live outside of the Sacramento area, even in another state of country, please email or call me so that I can give information on a mode that can help,most likely reduce or eliminate the pain that you are experiencing. The following is an article written by John F. Barnes, P.T. on the topic of Post Traumatic Stress Disorder. Most people have at least heard of the term "body memory" or "tissue memory". The Mayofascial Release perspective believes that it is within the intricate matrix of the myofascial, or connective tissue that holds this memory and the myofascial tissue is literally the "record keeper" of memory in the body/mind complex." When trauma occurs, whether physical, mental, emotional or a combination of these, people respond with a flight/fight or freeze response. It is this unresolved freeze response that we MFR therapists believe is what holds us back from fully and naturally healing from a traumatic event. Stress and worry act similarly. Anxiety symptoms and symptoms of depression may surface. These feelings become embedded into our cellular memory causing us havoc until we release them. You can get relief with releasing your anxiety symptoms and symptoms of depression in the process of Myofascial Release and Craniosacral Therapy that Vicki does. If you are fed up with the constant mind chatter and feelings of fear and worry know that you do have the power to overcome this and I would be happy to help and show you how. You can replace the pains of fear, worry, and stress with peace, harmony, contentment, and joy. What is Myofascial Release and Craniosacral Therapy and how can help ease or get rid of my pain? I have had many believe that I could not help them with their pain and then during their session with me, confided that they now believer I can help them with their pain relief. It may seem difficult to understand how the body, when guided, can easily and quickly dissolve pains away without surgery or drugs. This is something that the mind may never understand, but as I work with clients whose pain is so intense, they normally wisely don't try to figure it out- but instead are relieved as they feel the pain releasing. Myofascial Release and Craniosacral Therapy are safe, gentle forms of releasing and balancing that have a deep impact on the body's tissues. 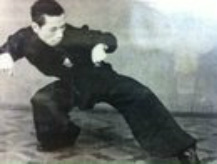 It is a whole body/mind/soul approach to reduce pain, restore movement, and improve your energy level and body function. This holistic therapy is the most effective form of bodywork available today and especially coupled with self care exercises at home can help you get free from pain for the long haul. The John F. Barnes, Myofascial Release Approach used is consistently effective in producing results that last, especially when complemented with self treatments. Fascia is a tough connective tissue which spreads throughout the body in a three-dimensional web from head to foot without interruption. Trauma, posture or inflammation can create a binding down of fascia resulting in excessive pressure on nerves, muscles, blood vessels, osseous structures and/or organs (pain). To help everyone get relief from pain and stress easily, gently,and effectively while preventing unnecessary drugs, surgery, or other damaging, invasive and costly procedures. On my first day of my Myofascial Release class in Cape Cod, after hearing the morning lecture of Myofascial Release l, taught by John F, Barnes the founder of it, I had a question to ask him, that I wanted to ask in private. So I waited until break before I stepped up to the podium to quickly get my question to him. His back was turned, as he was reaching for his glass of water to drink. As he turned around to face me, I remember how I just suddenly became overcome with tears, which usually occurs when I am in the presence of people who contain within themselves great healing powers and intuitiveness. The tears signify a healing process is taking place within me. After wiping some tears away, and as he kindly smiled, I asked my question and he helpfully answered. As I was turning away, satisfied with his answer, he then added....."You're going to be good at this". "The doctor of the future will give no medicine, but will interest his patient in the care of the human frame, in proper diet, and in the cause and prevention of disease." How long is a Myofascial Release, Craniosacral Therapy session? Your Myofascial Release Craniosacral Therapy session is usually more intense and requires more treatment at your first appointment, taking a little more bit over 1 hour. An assessment is taken and it requires patience to hold proper positions for a period of time for the release of the fascia, and hence release of the pain to occur. The whole body eventually should to be addressed and cleared of fascia restrictions for optimum results, thereby requiring followup visits and to re-train the fascia that was released. The amount of visits depends on the depth of work needed. You don't want to have to start all over again in your myofascial release, so it's recommended to return within a week for the follow-up session. Vicki searches the full body for knots, hardness, and adhesions. It is important for the client to follow-up with the next suggested appointment schedule and any self care recommended at home. One of the most pertanent factors in health is the way the client handles stress and his or her everyday thought process intake and thinking management. Vicki goes over how to handle the stress. If the client is not good at re-directing the stress and thought processes, than new stresses come into the body and pain returns or is enhanced. If the client needs help with dissolving stresses and repeated thought patterns, Vicki is available to do Release the Stress sessions over Skype or the phone. See here. Equally important in healing in the "Repair" Stage, is the "Maintenance" Stage, in staying strong and healthy. This would be an appointments each month to check and release adhesions and restrictions, like a "tune-up". Every session and treatment modality given for the body part being addressed, is unique and tailored for that specific body area situation, for that time. Intuitive guidance, for helping with the body's myofascial release, is a large factor during the Release the Pain sessions. Vicki encourages active communication and feedback during the session from the client. This is helpful for pain relief. For the client's best results in breaking away from pain and myofascial release, Vicki includes her client to be an active partner and participant in the session and as a team they work together, resulting in a fabulous release of fascia and pain. Myofascial Release is most effectively done as a treatment program with a frequency of one to three times per week, initially. This allows the tissues to release, the body to move back into proper alignment, and for the home exercises to be practiced and understood for continued improvement and maintenance. The distance between successive appointments is increased as the sessions progress. You can choose to have a single session, if you are not experiencing any problems and to simply get relaxation and de-stress of your whole body/mind. Normally only specific intense areas of the body are addressed in a session, because fascial restrictions are densely segmented. While Vicki may not directly touch the entire body, indirectly she is positively effecting the entire mind/body/soul of each client, through the woven web of the fascia connection, where she is working, and this is what sets Myofascial Release and Craniosacral Therapy apart from the other modalities. The body's cells & atoms are independant and intelligent and they communicate with each other and are constantly moving, which sets the perfect stage for the body to heal itself. You will leave each session feeling total mind/body/soul relaxed, (you might fall asleep during the session, in some cases or at least will be able to sleep well that night). Vicki is so confident that at the end of your session you will be fully relaxed and stress free that we back the session up with a guaranteed 100% money back offer. pain relief or elimination of the pain can happen naturally when using fascial release with Myofascial Release, Craniosacral and OrthopedicTherapy. Here's an inspiring,interesting story of a man who was brought back to 'normal' from John Barnes and his 'Tribe', at the Myofascial Release center in Sedona, Arizona. He later became a MFR therapist. The man is Dan Betz, practicing in Florida. Click to "open minded" then go to "Home"
Why Do I Love Being a Myofascial release and Craniosacral Therapist? Everyone can benefit- Pregnant moms, newborns,children, elderly, athletes, musicians, etc. When you travel out of town you can find other certified massage therapists by clicking here.